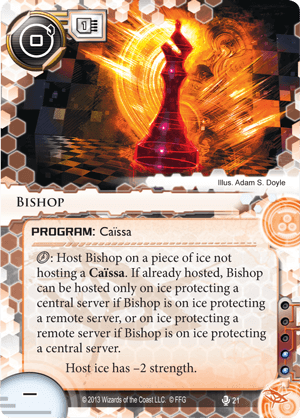 click: Host Bishop on a piece of ice not hosting a Caïssa. If already hosted, Bishop can be hosted only on ice protecting a central server if Bishop is on ice protecting a remote server, or on ice protecting a remote server if Bishop is on ice protecting a central server. Even in Deep Red/Caïssa builds, Bishop doesn't see much love. There's a lot to dislike about Bishop, not the least of which is that one of only four Caïssa programs is wasted here. Sorry, chess decks. I suppose Bishop could be used to increase the utility of Mimic and Yog.0, but that would require you to either know in advance which cards need targeting or blindly facecheck ICE until you find the one that needs weakening. At that point, you've probably lost the damn thing to the damage you took anyway. And God help you if you need to move the Bishop to another piece of ICE on a central, because its convoluted movement rules make it all but worthless if you're focusing on either centrals or remotes. The ideal situation for Bishop is to be able to Yog something like a Tollbooth, but for your money, why not just use a more general-purpose Datasucker or Parasite? Just pack a MemStrips and save the Deep Red memory for Rooks and Knights.